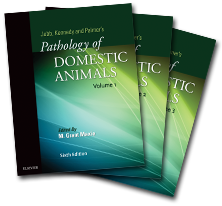 Thank you for visiting the companion website for the sixth edition of Jubb, Kennedy, and Palmer’s Pathology of Domestic Animals. This book has long been regarded as the most comprehensive reference on domestic mammalian pathology. It provides a complete guide to the diagnosis of hundreds of conditions of small ruminants, horses, swine, cattle, camelids, dogs, and cats. For the first time the book is offered with a companion website. Featured here are all of the images from within the book plus an additional 325 bonus images. The 3,100 high-quality images displayed feature detailed views of gross pathology, histopathology, and ultrastructural pathology. The website also offers more than 11,500 references that are linked to their original abstracts in PubMed. We hope you will access the website often to complete your learning experience.